If you’re short on space and are looking for an easy way to increase your gardening yield, hanging baskets are the way forward. They can be hung outdoors or indoors. Just bear in mind that you’ll get drips on the surface underneath them when you water them. Bathrooms and kitchen windowsills are good places to hang them as you can simply wipe them clean afterwards, though you may prefer to grow carrots and radishes rather than fruit and veg that’s exposed to the air in the bathroom. There are loads of gorgeous hanging basket designs to choose from, ranging from as little as £1, and you can grow lots of different things in them. They work well with strawberries and tomatoes (particularly tumbling ones). You can hang one in the kitchen filled with herbs designed for cooking (basil, chives, parsley). 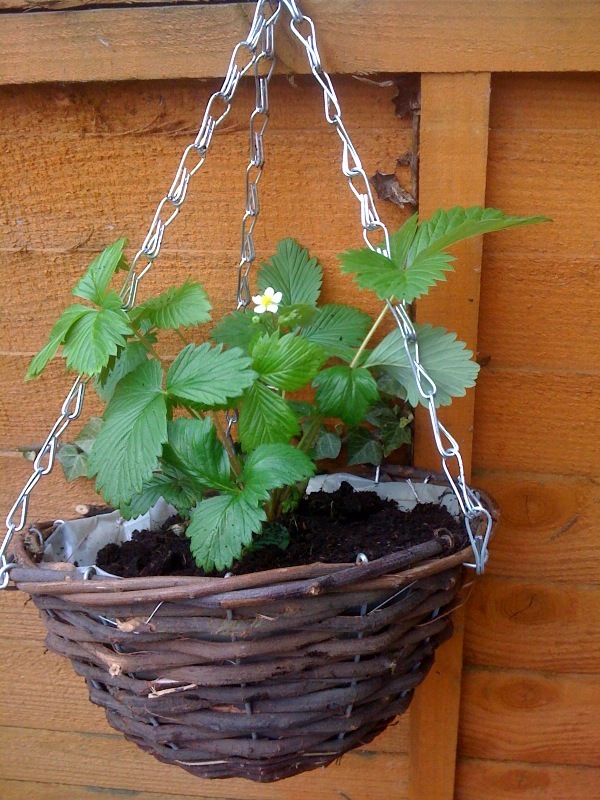 You can also create a cocktail making hanging basket including mint, lemon balm and coriander. Of course, you could use a hanging basket for flowers but that seems like a waste to me (unless they’re edible flowers, of course). The downside of hanging baskets is that they do take a lot of watering, and if they’re outdoors, you still have to keep an eye out for slugs and snails because they can climb. 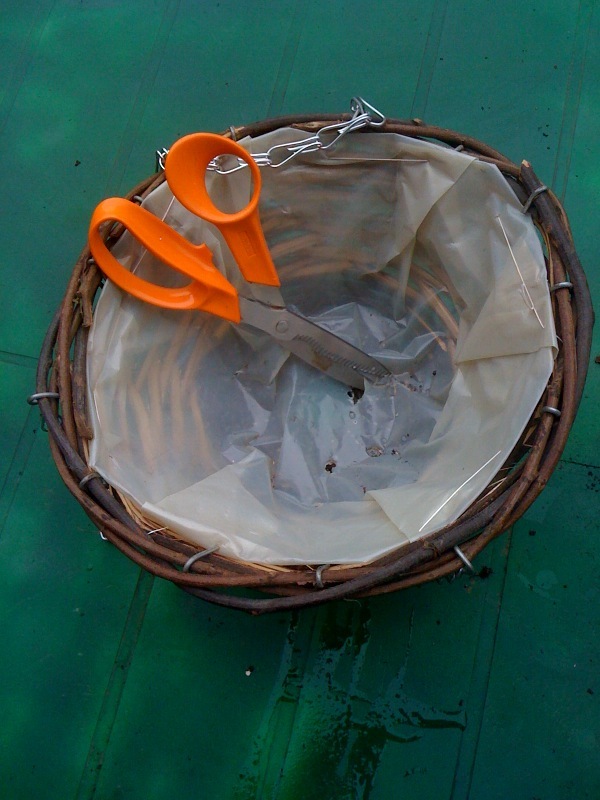 However, you can minimise these risks by adding moisture control gel to your compost and putting copper tape around the edge or base of your hanging basket, as slugs don’t like crawling over it (and it’s a child/pet-safe way to protect your plants from slugs). Other than that it’s easy. Put drainage holes in the bottom of the hanging basket so that it doesn’t get waterlogged. 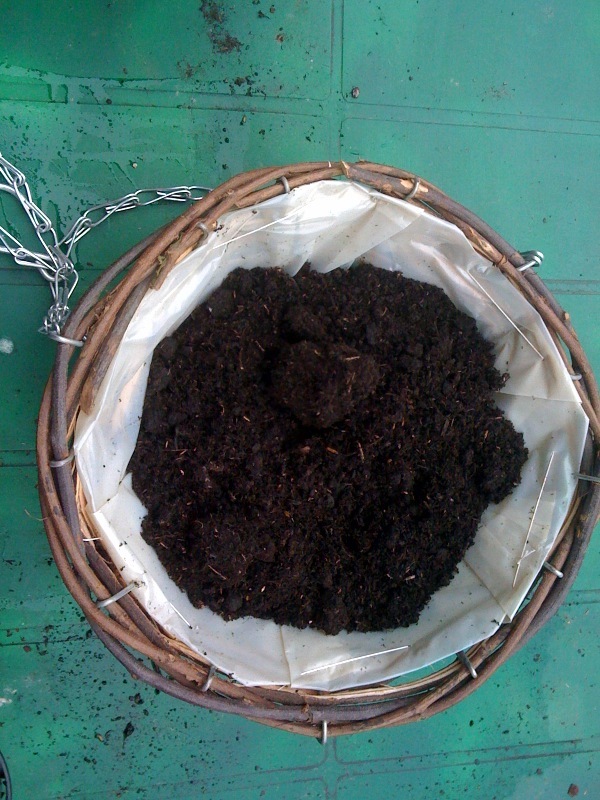 Fill the basket with soil to about 2/3 of the way up. 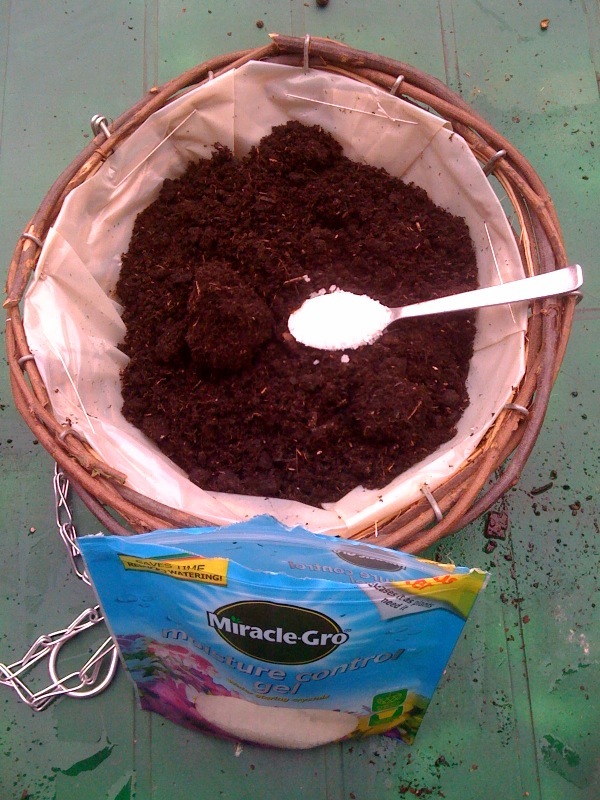 Add moisture control gel to soil according to instructions – this 12 inch pot required 3-4 tablespoons. I opted for 4 as watering can get relentless once the sunny weather kicks in, and every little helps. Mix moisture control gel into soil with your fingers, breaking up any lumps in the compost as you go – a feeling not dislike that of making crumble topping. 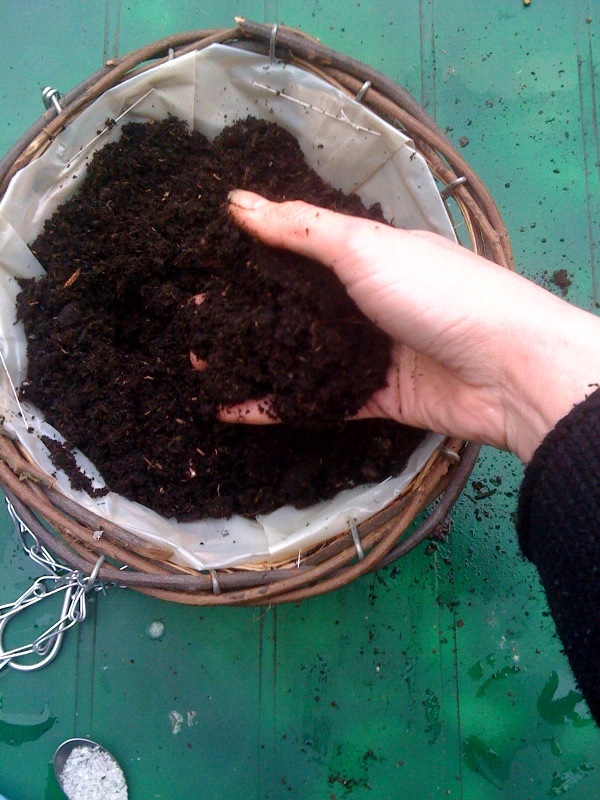 Wearing gardening gloves when you do this will stop compost from getting lodged underneath your nails. I forgot, so had to give them a good scrub instead. 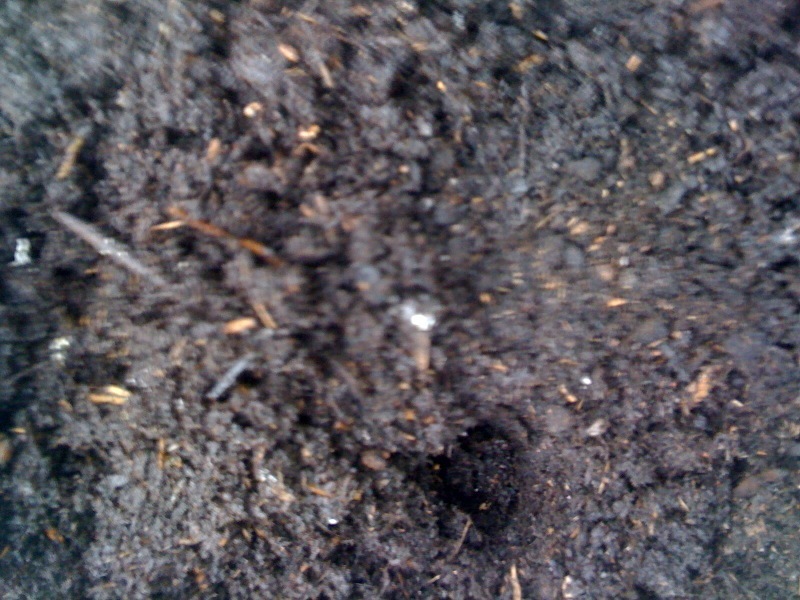 Dib a hole in the soil for your seedling or plant. I used my finger to dib a hole for the tomato seedlings, and used my hand to scoop out a bigger hole for the strawberry, which was much more developed. You could use a dibber and a trowel if you care about your nails though. Put your seedling into the hole, fill the hole with soil and pat down gently. 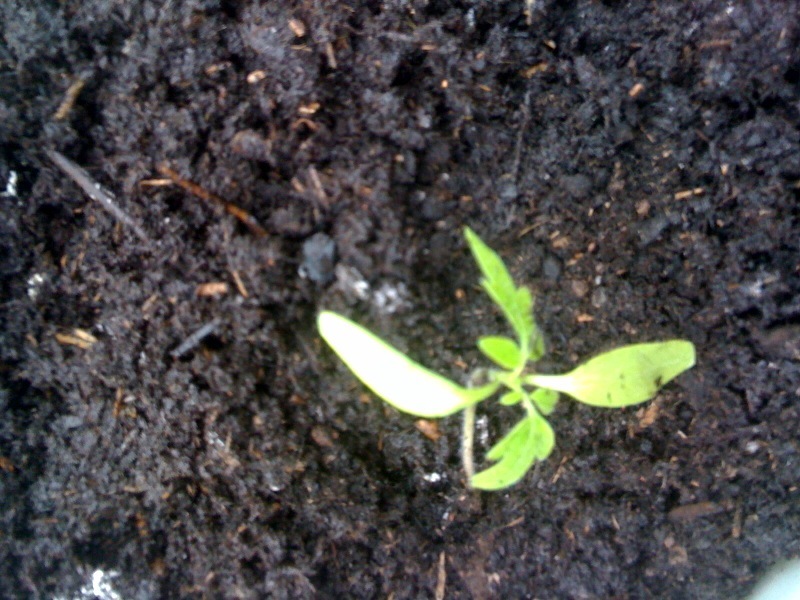 This is a tomato seedling. It’s a little young to be moved – really, they should be 5-8 weeks old and these ones are only about a month old, but they looked like they’d outgrown their seedling pots and needed fresh compost so I decided to gamble with it. 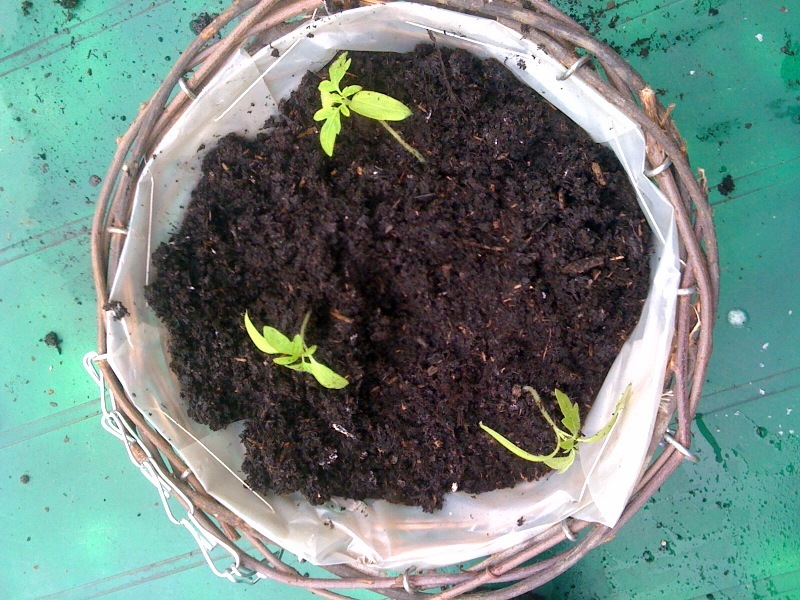 I have a lot of tomato seedlings – not that I want to lose even one. Repeat for remaining seedlings – allow 2-4 plants to a 12 inch pot, or use your common sense if you’ve grown a particular breed of tomatoes/strawberries before and know how big they get. I opted for only putting one wild strawberry plant in the other planter as it’s pretty big and I wanted to give it the best chance to thrive.